Find artworks, auction results, sale prices and pictures of Zara Matthews at auctions worldwide. 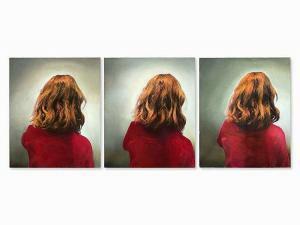 This impressive triptych by Zara Matthews (b. 1960) was created in 2002. The contemporary British artist is known for her hauntingly beautiful images, which cast a spell over the viewer. The present paintings show the rear view of a young girl in a barely changed position. 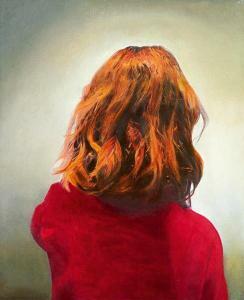 The red blouse and strawberry-blond hair stand out before indistinct gray background. The three paintings are in very good condition with here and there only minimal color abrasions to the edges. The canvases are each stretched on a wooden panel. The panels are signed 'Zara Matthews', titled 'Girl Triptych' and dated '2002' as well as inscribed with the artist's studio address on the verso. The dimensions are 81.5 x 66.5 cm each.